We have a special privilege this week. I have an interview with Kendra Smith to share with you. Kendra recently won the Star City Games Pauper Classic, the largest paper Pauper tournament of its kind to its date. Kendra is a L1 Magic Judge, Pauper Enthusiast, and Twitch Streamer, and writes content for Hipsters of the Coast. You can follow her on Twitter @TheMaverickGal. Her deck she piloted was Elves, a known Pauper archetype, but not one of the most popular decks in the format. On her way to victory, she overcame a Top 8 of three Izzet Delver decks, a Boros Monarch Deck, Mono-Black Control, Dimir Alchemy, and a Tortured Existence graveyard deck. DW: Your deck of choice, Elves, is one of those personality decks that has a real cult following. 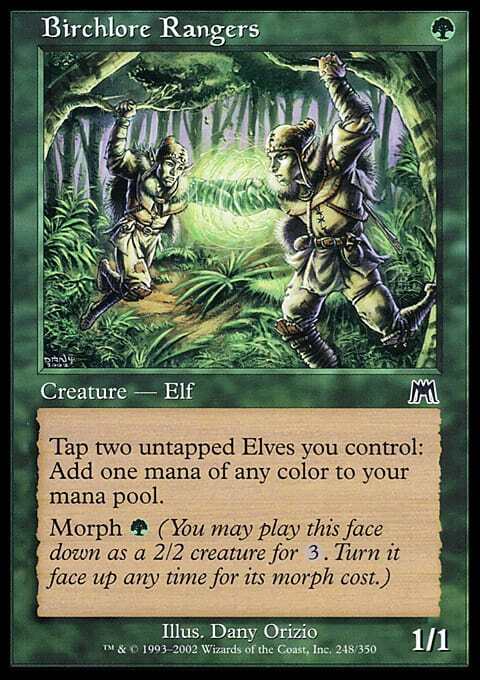 What do you like best about playing Pauper Elves? KS: Elves is a very nostalgic deck for me. It takes me back to my days when I was first trying out competitive Magic during Onslaught block and lets me remember all the crazy things I was able to do back then with the deck. It also helps that I love doing crazy mana-heavy things. One of my main Legacy decks is High Tide, and Elves allows me to do a lot of the same. DW: Kendra, you're one of the first big winners of a major paper Pauper event, the SCG Pauper Classic. I've never had a chance to play Pauper in paper before. Can you tell about some of the differences between paper Pauper and playing Pauper on MTGO? KS: Playing paper Pauper is definitely a bit more daunting than playing online, at least when it comes to Elves. Managing numerous triggers is a breeze on Magic Online but in paper it can be difficult to navigate, as well as handling a very cluttered board state. Not only does it make some decks more difficult to play, but it does the opposite for others. Decks like Familiars, Freed From The Reel Combo, Tron, and Tortured Existence all benefit from not having to deal with constant trigger activations and trying to push them through in an adequate time. The clock in paper events also rewards the slower deck if their opponent is on a deck that's able to play quickly, as it allows them more time to play that they wouldn't get so much online. DW: I read that you expected to face a very different metagame when you set out to play paper Pauper, one influenced by two unintuitive factors: first, the amount of overlap between a given Pauper deck and a known deck of another format, like Modern, and secondly, the card scarcity of some lesser available Pauper staples. Can you comment on the differences between the MTGO Pauper metagame and the decks you faced at SCG Roanoke? KS: The meta diverged a bit, but looking at the Top 16 it definitely feels very reflective of the online meta, by and large. We did have a great turn out with a lot of variety but some decks that would normally show up a lot online, such as Tron and Izzet Blitz, were hardly anywhere to be found. I expected a largely “blind” metagame but for the numbers to be a bit more skewed based on card availability since that might add to the number of people just trying to pick up something to play. It seems I was wrong, but that's totally fine by me! The metagame was definitely diverse and fun on the whole. DW: What were the toughest matchups you faced en route to your SCG victory? KS: Boros Monarch gave me a real tough time in my first match. Thankfully I managed to win out from there, but what's usually a slightly favored matchup, against Boros, turned out to not be in my favor this time around. In addition, it's certainly worth mentioning the Enchantment Control and Tortured Existence players who wiped my board out multiple times and that I barely managed to come back! DW: My reservation to playing Elves is that it feels too easy to hate. Every deck seems ready with sweepers: Crypt Rats, Krark-Clan Shaman, Evincar's Justice, Martyr of Ashes, Swirling Sandstorm, Blazing Volley, Shrivel or the most common sweeper in Pauper, Electrickery. How do you fight the hate both in your deck preparation and play style with Elves? KS: Hate cards can be easy if you sideboard right. Some are just difficult to deal with overall but if you sideboard right, you can beat them. Even if you can't, the trick is to avoid overextending yourself to the best of your ability and to hold up ways to bounce back from a board wipe. With the possible exception of Pestilence and Guardian of the Guildpact lock or buybacked Evincar's Justice, even if they wipe you out, never give in, as you never know when your opponent will run out of gas and you find your Lead the Stampede. DW: What is your favorite secret play to make with Elves? KS: Favorite secret play you say? Well some of the cool things you can do with Birchlore Rangers definitely come to mind. A lot of people I hear question the utility of the Morph ability. Putting it down as a beater, for defense, or as a way to dodge a sweeper are all valid lines, especially if you have plenty of mana. Don't be afraid to do this. Did you know that as a Morphed creature it's also colorless? That means Prismatic Strands won't affect it at all. Another cool trick players sometimes miss is that if you're up against a creature with Provoke (usually Deftblade Elite in Mono White Heroic), you can wait until the Provoke ability resolves and use the Birchlore Rangers to tap the provoked creature, saving key creatures from a potentially certain death. DW: Pauper is really growing as a format. Any advice for someone looking to get into Pauper? KS: If you're looking to get into Pauper, play what you love. There's almost always a deck for someone's play style out there and you just have to find it. It might even take you a couple decks to find that right one but the format's affordable enough that you can try plenty of different things. With a metagame as diverse as this one, don't get too overwhelmed. Just remember: the more you play, the more you learn, and the better you get. DW: Finally, what is one thing you wish WOTC would do to support Pauper? KS: Make the format sanctionable. Seriously. I earned just a single participation Planeswalker Point for winning the event and that's not going to do anything towards helping me at other events like any future Grand Prix, and it would give more players an incentive to keep playing the format. I know numerous people who tried the format, enjoyed it, and then stopped playing when they realized this was going on. Also sort out the legality issue with the format. The Affinity player in the Top 16 of the Classic had three basic Mountains listed in their sideboard and the odds are good that those were originally Red Elemental Blasts which are confusingly not legal in the format where the almost identical Pyroblast is legal due to Magic Online. Thank you, Kendra, for this awesome interview!